Now in its sixth year, this annual competition celebrates the amazing contributions that Leeds residents, schools, businesses and students make to their local environment. 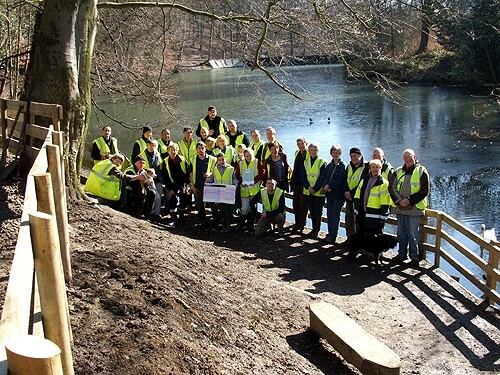 In previous years, over 22,000 people have been involved in 170 entries, all of which highlight the diverse and dedicated work of people committed to seeing Leeds become cleaner and greener. 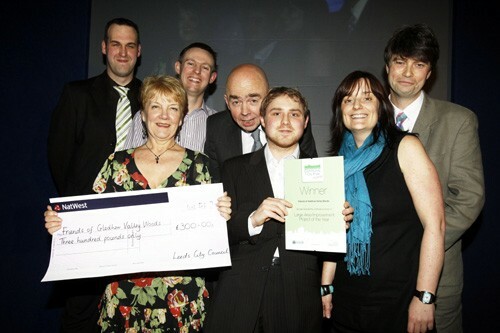 At the awards ceremony on 4th February 2010 at Leeds Civic Hall, FGVW was presented with the "Large Area Improvement Project of the Year Award 2009" for its work in rebuilding the jetty by Gledhow Lake. 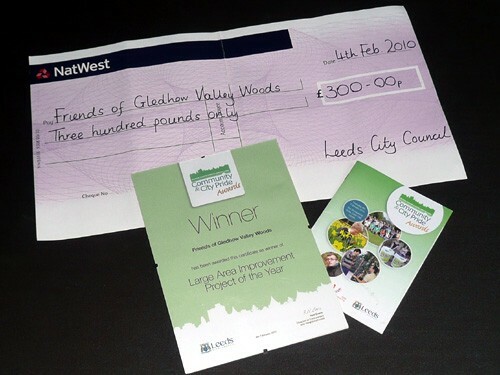 The group received a certificate and a cheque for £300 to be put towards future projects. The Gledhow Valley woods Lake Landing Stage was chosen as a project because the original landing stage had eroded over the years and was in an unsafe condition. The stage or jetty has been used by many generations of families to feed many generations of birds and it was a shame that it was no longer safe for children to use. We discussed the project with Bob Bradley from Leeds City Council Parks and Countryside and he approved our ideas. The plan for re-construction of the landing stage was the idea of one of or members, Mervyn Clayton. The plan was to use 6 gabion baskets laid on the level remains of the original landing stage, inserting fence posts along the lake facing edges and corners, then filling the baskets with 20 tonnes of gabion stone using handballing and wheelbarrows to transfer the stone. A fence could then be constructed and a suitable surface laid on top of the baskets to create a standing area. The aim was to create a safe, enclosed area where families could safely feed the swans, ducks. moorhens and coots. 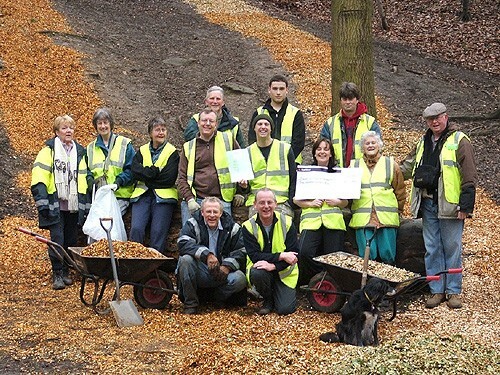 The project was carried out by the Friends of Gledhow Valley Woods (FGVW). Bob Bradley organised the digging out and levelling of the approach path a couple of weeks before the big day but the construction of the stage was done by FGVW. The only major hurdle was to organise delivery of the 20 tonnes of gabion stone, delivered in 4 tonne loads as there was a bridge to cross to reach the work site which was not strong enough for a 20 tonne load. The funding to pay for the timber, gabion baskets, gabion wire and stone came from a Section 106 grant. The aim of the big day was to get as much done as possible depending on the amount of available labour and to leave the area safe, before finishing the landing stage and surrounds at later Action Mornings. The first load of stone was delivered the day before so the driver was familiar with the location. There was no turning area so the lorry had to reverse to the site before tipping. The first volunteers were on site at 7am and after erecting 2 gazebos for use by the catering team, started to make the 6 flat gabion cages into 5ft by 3ft by 3ft oblong baskets. These were then placed side by side on the original foundations and wired together. Fence posts were inserted along the lake facing edges and corners. The lorry loads of stone were regularly arriving, creating a huge and daunting pile of stone to be shifted. We had never attempted to move 20 tonnes of stone in one session before this day! The baskets were then part filled by hand and wheel barrow, before strengthening wires were tied across the centres of the baskets. This process could then be repeated until the baskets were full. Lunch was provided by FGVW members in the form of a BBQ and work carried on all afternoon. 20 tonnes of stone is a massive amount to move but FGVW members stuck at it and around 4pm the baskets were full and the lids could be tied down with wire. We then built the fence using the solid fence posts around the landing stage and also put up some temporary fencing to make the area safe. Whilst some of the team were fencing, others were laying limestone crusher run on top of the baskets to create a level area for walking on. We finally achieved our aims for the day at 6pm. Over the course of the day, 38 FGVW volunteers attended. On the 2 following days, the area was finished off and the sloping path to access the landing stage was surfaced by smaller work parties of FGVW volunteers. On 2 further Action Mornings, the temporary fencing was replaced by permanent fencing to complete the project. On Monday 27th October, John Casey from Parks and Countryside at Potternewton Park, gave his approval to the construction and safety of the landing stage. The Construction of the Landing Stage was by far the biggest project we have tackled. It was a huge effort by FGVW members, but we have received copious praise from local residents and thus the efforts were extremely worthwhile. It is pleasing to see the Landing Stage in daily use by visitors to the lake. 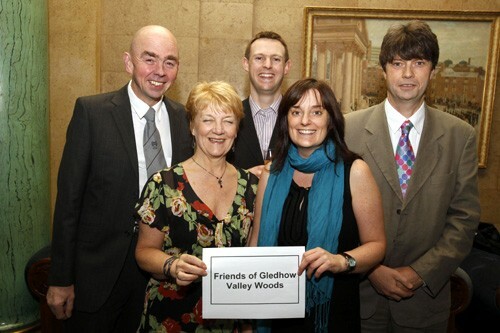 The project fulfilled FGVW aims by improving accessibility for local people. The Landing Stage is now accessible to pushchairs and wheelchair users and has made the lake attractive to many more visitors and of course the residents of the lake. Photos of the actual project in progress can be found on the 25-10-2008 Rebuilding the Gledhow Lake Jetty page.